Most of the time, the firsts we have in life aren’t that great. Our first kisses, jobs, and apartments are usually stepping stones for us to learn what we want, and later how to get it. Sadly, finance isn’t part of the usual learning process. Generally it’s a lot like religion, and we either do what our parents did, or nothing at all. In most cases, both are bad choices. Saving money can cost much more than you realize. This is because the first financial lesson we usually get is that saving money is a good thing. The lesson usually comes from a well meaning family member or relative in the form of a savings account. Over time we learn to watch that money grow, discovering interest, compounding, and the power of savings. Unfortunately these early lessons don’t teach us about inflation. Instead we learn to focus on the face value of our currency, rather than its purchasing power. By not considering how inflation changes our savings, the amount of money we have saved is relatively meaningless in terms of practical application or real accomplishment. 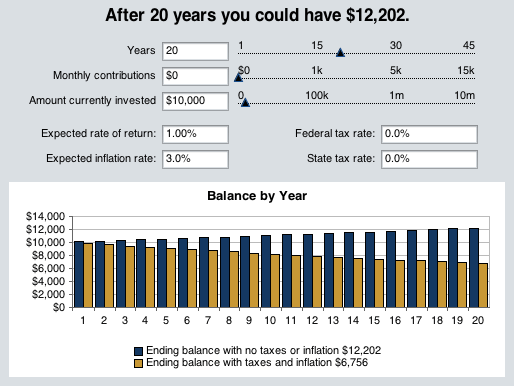 For example, the following table shows what happens to $10,000 when it is placed in an account with a 1% average return, represented in blue, compared to the actual purchasing power of that savings when a 3% rate of inflation is factored in. Keep in mind that this is before any taxes or fees are considered. After considering the impact of inflation, most savings accounts quickly lose their appeal. As you can see, our $10,000 compounded yearly for 20 years at an average return of 1% results in a total savings of $12,202. While that’s hardly impressive, on paper it’s something the average saver wouldn’t be upset about. It’s also something any banker would tell you is a perfectly acceptable return based on current market conditions. Fortunately the yellow bar shows us reality, and that’s the fact that the purchasing power of our savings has depreciated almost 50%, to $6,756. This highlights exactly why banks don’t discuss inflation with the average consumer. No one would ever save anything, because after 20 years it’s about the same as burning half your money. Even if we skew the figures in favor of the savings account by increasing our average yearly return to 5%, the picture isn’t much better. 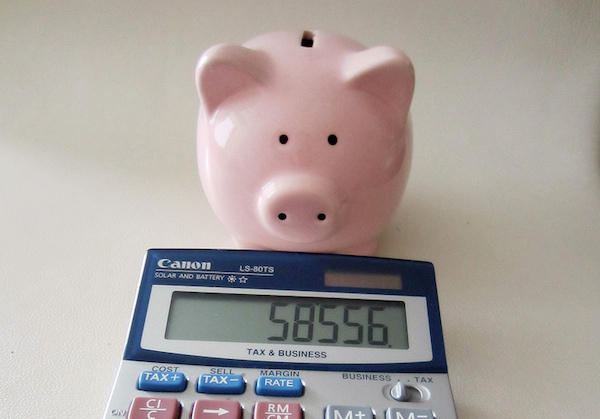 Our newly calculated savings would have a purchasing power of $14,691. While that is certainly much better than our previous example, we’re still barely ahead of inflation. This is the hidden cost of savings. Even if you save money in the best savings accounts you can find, when you retire you’ll be lucky to have significantly more than the purchasing power that money had when you saved it. To make matters worse, banks are advertising how you can ‘watch your savings grow’ by opening a savings account. Despite being financial experts, for some reason it’s perfectly legal for them to mislead consumers into destroying their own personal finances. So, if you really want to do someone a financial favor, teach him or her to invest. Just teaching them how to save is a recipe for financial failure.